WITH 27 STATIONS TO CHOOSE FROM, WHERE WILL YOUR NEXT LINK ADVENTURE BEGIN? If you are like us here at Link HQ, you are getting pretty sick of the rain we have been having the past week. The rain makes it harder to enjoy your morning commute or your ride to go get lunch, or evening workout or any other type of ride you may enjoy. Although riding in the rain does not seem like the best idea, it can still be enjoyable. The Link bikes come equipped with fenders and splash guards to help keep the water from splashing up on you, the bikes also have lights and reflective sidewalls on the wheels to help keep you visible. Follow a few simple steps to help you stay dry and you can be out enjoying a ride in the rain in no time! Riding comfortably and prudently in the rain is relatively easy using some common sense, preparation, and a bit of additional gear. There is no such thing as “bad biking weather”, just ask those happy folks cycling around rainy Portland or snowy Minneapolis every day of the year! Let’s take a look at how they do it, while staying stylish and still arriving at home or work in warm, dry socks. A synthetic or wool (non-cotton) base layer (underclothes) will keep the sweat from sticking. A wool or fleece (again, non-cotton) outer layer (shirt or sweater) will breathe but keep you warm in cold temperatures. A waterproof jacket or rain cape will keep the water out, but avoid hoods that cover your ears and keep you from hearing traffic noise. Waterproof rain pants and boots or shoe covers will keep you dry from all of the water that your tires will splash up from the roadway. Neon and bright colors are especially important in dim but not dark conditions. A waterproof bag, pannier, or backpack will ensure that all of your valuables stay dry even if you don’t. You can put a rain cover over your bike helmet but avoid wearing a hood that covers your ears. You need to be able to hear traffic to stay safe, especially in rainy conditions. Alternately, if it is rainy but not too cold you can ride in quick drying, synthetic biking gear but carry a change of clothes in a waterproof bag or pannier. Once at work you can then towel off and change into your work clothes, then by the end of the day your bike gear is (mostly) dry and ready for you to ride home in! Consider keeping a pair of shoes, socks, and pants at work that you can change into in a pinch, in case you are caught in the rain and arrive at work wetter than expected. Highly recommended: Plenty of bright lights AND reflectors to the front, rear, and sides of your bike (even during the day!). Fenders on your front and rear wheels will keep water on the road from splashing up onto you. Longer, “full” fenders will also prevent some dirt and grit from getting into your chain and gears, keeping things running smoothly. Bike brakes are much less effective when wet. Take it slower than normal and give yourself LOTS more time to stop. Metal, painted, and brick surfaces in the roadway can become very slippery during and after the rain. This means watch out for train tracks, manholes, bike lane markings, etc. When you cross over them keep your handlebars straight, not turning, to avoid a slip. Hands and feet get the coldest when biking, if wet and unprotected. If you plan to bike more than just a couple miles in the rain, make sure both are covered with waterproof and well insulated material. Beware of bike-eating puddles! Even little ones can hide nasty things like potholes, nails, or glass, which can cause a flat tire or a crash. After your ride, take some time to wipe water and dirt off the metal bike wheel rims, front and back. This will ensure that the brakes are still effective the next time you take your bike out. Also wipe water off the chain after a rain ride, and squirt on a little bike lubricant if possible. This prevents rust from building up on the chain, extending its life. 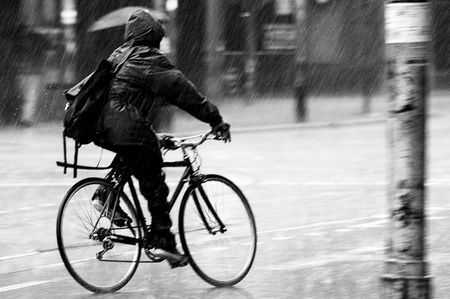 Most importantly, don’t worry about getting a little wet and don’t let the rain keep you from having fun on your bike! With the exception of some wicked witches, most humans are water-resistant and will get through it just fine. Everyone has their own routine and preferences, so feel free to experiment and see what works for you.